The very first thing you will not do is to turn on the soldering iron! As I stated early on I am a "noodling type" guy and you should be too, before undertaking this project. A plan in hand is worth its weight in gold. Thus follow a process that lets you think through the total project so that the end state is not a major mess. Trust me I had to learn this the very hard way. The first step is to organize the work area so that you have the tools, parts, schematics and adequate lighting. Solder bridges, wrong parts installed and wrong connections are hard to spot when your work area is illuminated like a darkened movie theater. Think about how big you would like to have your rig. I have built really small SSB transceivers such as the shirt pocket rig whose front panel is 2" X 2" and is 4 " long. That is 16 cubic inches and I have built ones that are one half cubic foot. My original goal for this project was a front panel of 2 X 6 inches. That was based upon splitting a sheet of 4 X 6 inch PC Board in two pieces. Yes the front and back panels are PC Board. The aluminum base plate which is the bottom of the rig, is 6 inches wide by 9 inches long and I managed to fit everything into that space. Taking a page from when I ran a large scale manufacturing operation -- build things so that you have access for servicing. (DFMA ~ Designed For Manufacturing & Assembly works for airplanes and ham radio gear!) There is the story of the famous small sized sports car that to change the oil you had to drop the engine. If you are building projects using surface mount --add some pads for test points. A short word about parts. Having a good junk box (junque boxe) facilitates building projects like this. Buy parts in bulk! You can buy ten 1/4 watt resistors that will cost about $1 but you can usually buy 100 resistors for $3. Simple math. I also attempt to use standard parts like 100 Ohm, 1K Ohm, 10nF, 100nF etc. Thus having bulk buys of common parts facilitates low cost building. The following link suggest common parts values for your Junque Boxe. I should mention this article originally appeared in QRP Quarterly and I am the author. I can be contacted at n6qwham@gmail.com for questions about common parts. Think Modules and a Systems Approach to the build. The Sudden Transceiver is no exception as it is built in Modules versus one very large circuit board. As time passes I may want to try new circuits or perhaps improve on ones already installed. Such changes are more readily accomplished when all you need to do is remove the old module and install the new one. If you paid attention to the servicing comment, the remove replace is unsolder a couple of wires and remove a few bolts. In the Systems Approach, I usually start at the back end and work my way forward. Build the Audio Amp Module first and get that working. Oh I have a simple test for this -- after checking the wiring and matching the parts installed to the schematic I connect a speaker to the output. Power on and index finger on the input -- a loud squeal and you know it works. Put it aside. My build approach initially is "al fresco" (not Al Fresco the singer) which means out in the open. My bench top is a piece of 1 X 12 pine and during the initial build, I simply screw the boards down to the bench top and interconnect the boards with wire and use solder braid to provide a common ground connection. Ugly but it works! The next item to build is the Arduino / Si5351. For this part I use perforated prototype board with through solder holes. I make sockets for the Arduino and the Si5351 using stock header boards which are soldered to the prototype board. In addition I install pin headers along each side of the socket strips. On the underside I bridge each pin of the socket to the mating pin header using #30 Kynar wire wrap wire. Don't get your underwear in a knot about wire wrap wire as the signals are mostly digital and the RF stuff coming out of the Si5351 uses coax. Thus I can use Jumper wires to access pins on the Arduino. The Si5351 as sold by Adafruit Industries uses SMA connectors. To interconnect to the Si5351, for general applications, I purchase a two foot long RG-174U piece of coax with a male SMA connector at each end (Jameco Electronics). By cutting the cable in half you have two pieces with an SMA connector at one end and a pigtail at the other. In this build since I am using a cross connected relay to reroute the LO and BFO signals, I used a six inch length cut in half and the three inch pieces connect to the DPDT relay. From the relay I used runs of RG-174U to connect to the IF Module with the wiring run underneath the PC Board. The photo below shows the Nano, the pin headers and the Si5351. For some interconnects such as Power and the Rotary Encoder I use headers and plugs. I can also access the Micro USB connector for programming changes. You do not want to have to remove the Nano just to make some program changes or improvements and you certainly risk damage to the devices. Provide access space and keep in mind DFMA! Most of the boards can be screwed down directly to my aluminum base plate or attached to the front and back panels. In the case of the IRF510 the back panel acts as a heat sink for this device after a suitable isolation pad is installed. One board that is installed above the base plate using 1/4 inch tapped aluminum pillars is the IF Module The reason for this is Wire Management! The signal coax to the NE602's as well as the main power wiring and the microphone amplifier output cable is run under the board. I drilled 3/16 inch holes at the proper locations so that the wire/cable penetrates the board at the desired location and this not only makes things "squared away' but facilitates the access for trouble shooting and signal tracing. Note the open nature of thus IF Module, the penetrations through the board and the four mounting screws which are attached to the four pillars. Of course as you can see in the two photos above the other board is the Arduino Nano / Si5351 combo. This layout demonstrates another principle mentioned as there is plenty of room to find parts and test points. While the temptation is to shrink this board (it is about 4 X 4 inches square) in size to make things more compact--DON'T! These are my notes from a fairly slow build of Pete’s latest creation over the last few weeks. When I first saw the design, it struck me that Pete’s approach was a perfect embodiment of his approach to building a piece and then checking if it works. 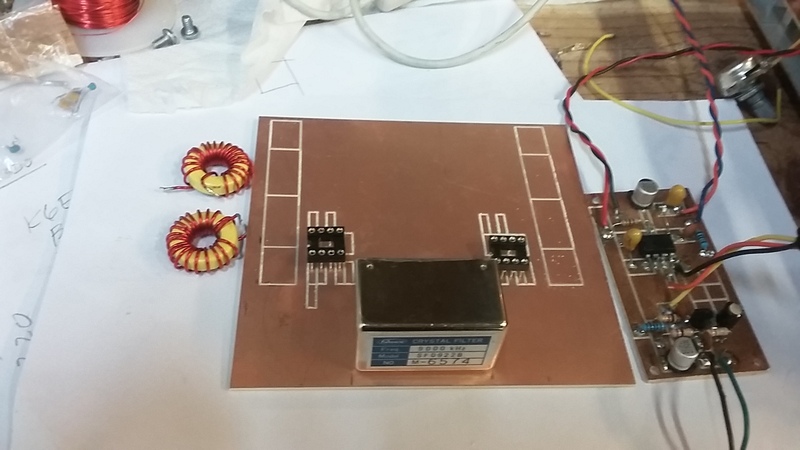 Normally, I would have emulated his approach using MeSquares rather than engraving isolated squares in the copper, but I have recently acquired a small engraving machine from the Internet, inspired by Pete’s approach, and started to learn to use “Sprint”, a low- cost PCB CAD package. Sprint is not free as KiCAD and Eagle are, but it is very simple to learn, and Tony G4WIF mentored me through getting started so I designed the modules in Sprint. The designs that I have adopted are essentially based on using 1206 SMD parts, I have also designed some modules to use components to hand using “muppet” style, i.e. soldering the components to the copper on the copper side of the board. This makes any debugging or alterations very easy, often without dismounting a board. 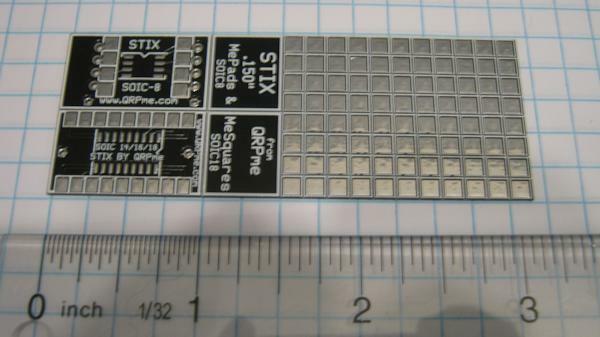 Where I have used SMD, I have also used some through hole components, e.g. electrolytics and trimmer resistors and of course the toroids. I will describe the build of each module, starting as Pete suggests with the audio amplifier and working through each of the additional modules. 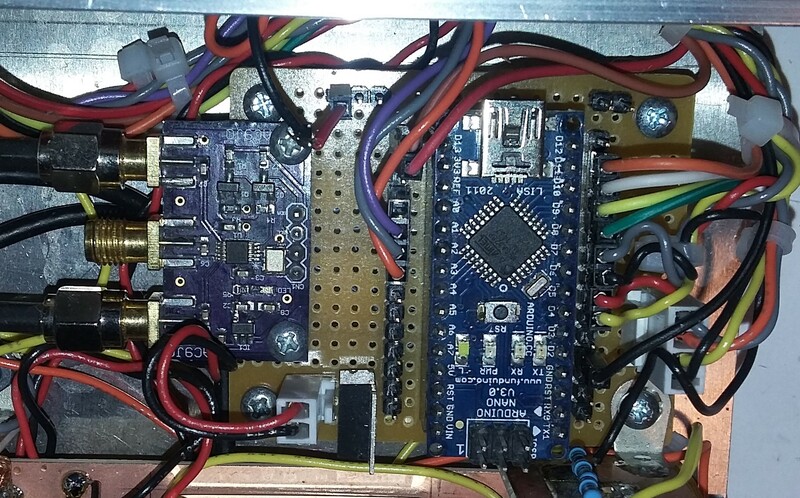 The audio amplifier stage is based on a tried and tested design that Pete has used many times elsewhere with either LM380 or a LM386 device driving the loudspeaker. Whilst the circuit lends itself to being constructed as a preamplifier and power amplifier, I elected to combine the two on to a single board as it is a handy module to have around for other circuits. I elected to use 8 pin DIL and 14 pin DIL through hole chips for this module. It would be relatively easy to re-design the boards for SMD versions of the devices. The LM380 is capable of outputting up to 2 watts so can draw a large current through the 10R resistor if driven hard. The LM380 stage should be built first and tested by applying a finger tip to the 47k resistor connected to Pin2 to verify that the stage works – a loud hum should be heard. If not, ensure that the supply is present and that the correct value of resistor has been used for the 10R as it is easy to confuse a 100r resistor and that the electrolytic (470uF) in the output is the correct way around. The NE5534 is a high-performance op amp with low noise, high output drive and high gain so makes a very good preamplifier for the receiver audio stage. The device is easily available at low cost in the UK and is stocked by Rapid Electronics amongst many other suppliers. you’ve used a 10nF on the input but a 100nF on the output – I’d expect them both to be 100nF ? I followed the layout that Pete has shown for the mixer section of the device. My original thinking was that by doing so, I would be able to change modules easily, in particular, the band pass filters as I envisioned noise problems on 40m from a local weed farm. However, it would seem that the aspiring cultivators have either given up or been encouraged to seek another career path as the noise levels locally now permit activity on 40m. The layout that I used soldered the legs of the coils directly to pads on the PCB and I have not earthed the cans – to do so will improve the performance of the filter by shielding it. The adjustment of the coils is inter-dependent, but it should be possible to obtain a pass band that is centred on 40m. In the absence of such test gear, they can be adjusted for optimal results later using an appropriate tool and listening to the received signal. Connections between the filters and mixer relays were made with RG 174 50-ohm coax which is both thin and flexible. These modules are at the heart of the device, but each module is remarkably simple, the magic happening as it does by using relays to switch the applied mixer frequencies and signals. The supply filtering is essential to keep the supply quiet as any noise here will appear as an intermodulation product. It comprises a 1mH choke obtained from Rapid Electronics and two capacitors forming a Pi filter. It is essential that the supply to the devices does not exceed 7v as they are designed to run on a lower voltage and are unlikely to survive 12v being applied. Each module is a mirror of the other with the function of pins 1 and 5 reversed. Particular attention should be paid to the wiring to the relay to ensure that the correct frequency is applied for the device to function in its intended role. The matching transformers are created by winding 7 turns on to an FT37-43 toroid, (usually black) then twisting a connection about ½” long and continuing to wind a further 5 turns. The tap should be prepared by careful scraping and tinned or simply tinned if the coating permits it and the continuity checked. At this point, there is little that can be done to check the section other than a visual inspection to ensure that the correct capacitor values have been used. 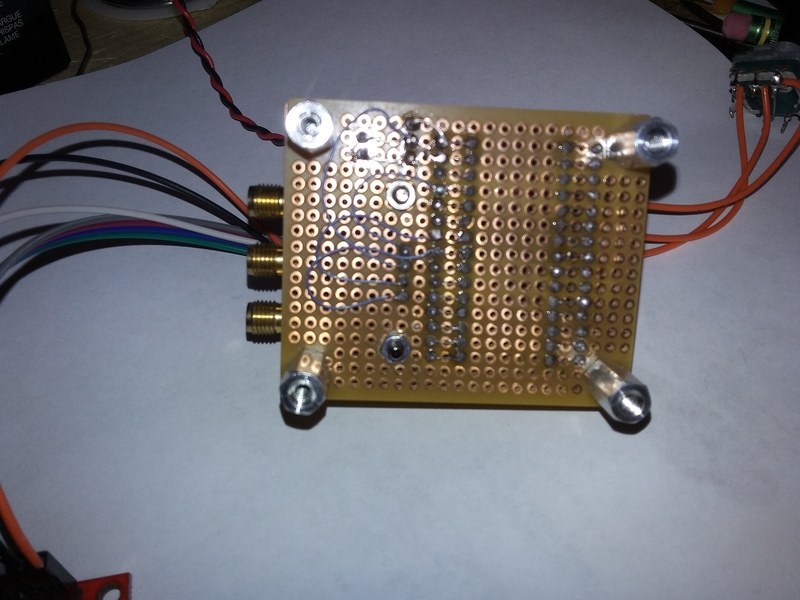 The crystal filter which may be obtained from G – QRP is a 6 pole 9MHz SSB crystal filter with a 2.2kHz bandwidth. Other similar crystal filters may be used but the IF frequency will have to be adjusted if they are not 9 MHz and the impedance matching provided by the tapped toroidal windings may have to be adjusted to ensure an optimal match. It should be noted that not all filters are bi-directional – the G-QRP filter is not symmetrical but functions perfectly well reversed. I used a spare 6v supply board obtained from eBay to provide a regulated 6v supply as I had it on the bench and it fitted the format that I had chosen for the circuit layout, but I have designed a similar board. 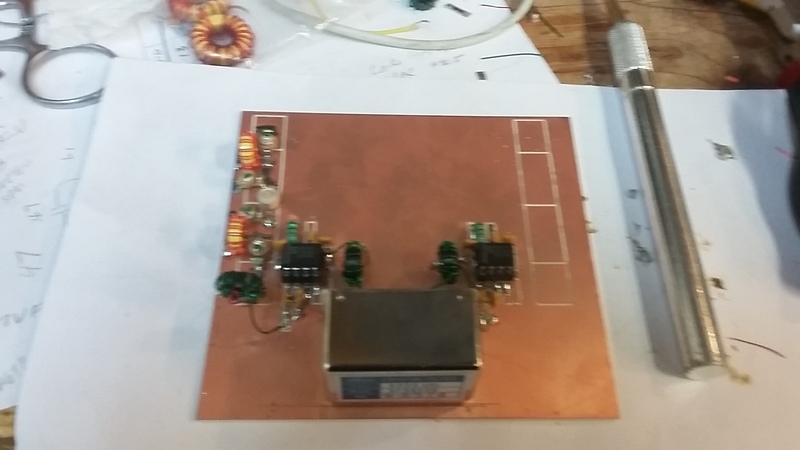 It will be sufficient to provide to isolated pads for supply in and out that are decoupled with suitable capacitors and to connect the earth pin of the regulator directly to the ground plane. I used a 1-amp regulator, but that is over-kill as the mixer devices are both relatively low current devices. Input amplification is provided by a 20dB amplifier using J310 devices and transformer coupled to the input Low pass filter. Some degree of control over the gain is provided by varying the gate voltage on one of the two J310s. this is currently controlled by a pot, but Pete has used this design elsewhere to provide AGC, so it seems reasonable to think that he plans to consider a similar approach on the Sudden. Care should be taken to wind the transformer carefully using the correct core and that when it is connected, it is correctly oriented to achieve the impedance matching which is critical to the circuit. Pete – you’ve used a 10uF de-coupling cap on the supply – that seems a bit low ? 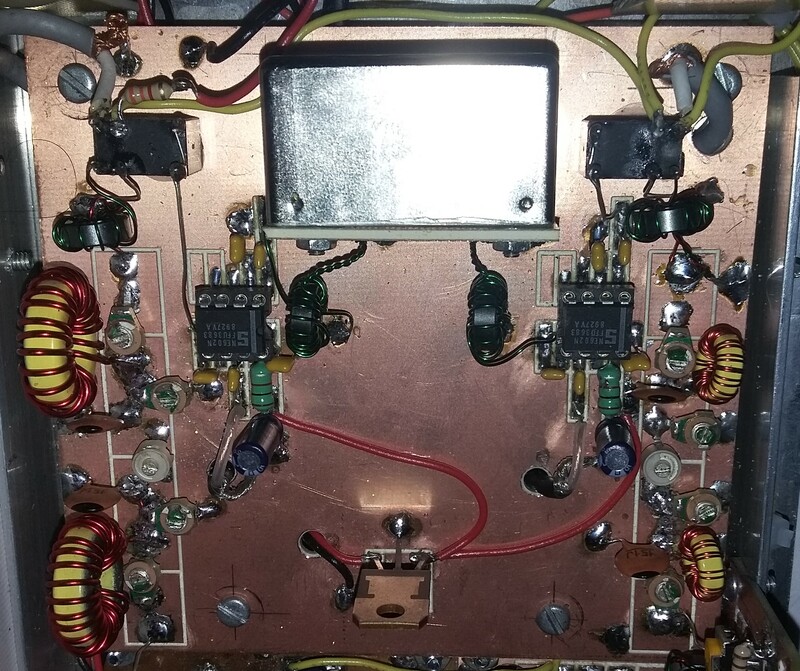 The front end filtering ahead of the amplifier is achieved via a Low Pass Filter that Pete has used elsewhere so it has the benefit of being a tried and tested design. Note that the toroids used are T37-6, usually yellow. Building the VFO is not as complex as it may seem at first glance. Pete has provided a lot of information as to what should connect where so a few minutes spent reviewing any of the thousands of diagrams showing the function of the Arduino Nano pins available on the web should serve to clarify any questions. It may be helpful to take the table that Pete has provided showing the connections between the Arduino and the rest of the circuit and to print that out when wiring it up. The approach that I took was to roughly replicate Pete’s layout and then to use finer wire wrap wire to make direct connections, checking all the time that I was sure that I was connecting to the Arduino pin that I thought that I was. Whilst time consuming, it wasn’t hard or especially fiddly so don’t be intimidated by it. It’s also worth reading through the listing for the sketch that Pete has provided as he lists the connections there too. Actually, it’s always worth reading the listing as it will help you understand what is happening under the hood / bonnet! Pete specifies an external switch to switch increments – the encoder that you have may have an additional switch available operated by pressing the shaft in which can also be used – he discusses use of the switch and the issue of FFS which I also have with my Rigol scope!! In keeping with “good practice”, the two oscillators outputs are derived from the outer pair of connections on the Si5351 board. I soldered the connections, but Pete has suggested fitting connectors and buying pre-built leads which is a good idea. If you have used a different crystal filter, you may have to tinker with the BFO frequency slightly to optimise it. Pete also mentions that there are some potential issues with the version of the Si5351 device and the correct driver as the syntax is very slightly different. This is described in his write up. The modules may be interconnected without any of the relays to verify that it works as a receiver. I used RG 174 with the screen only connected at one end and then grounded all the boards to a single common point to avoid the risk of earth loops and can verify that the rx does indeed work very well. I had an issue with the rotary encoder that I tried initially, and which missed steps but changing it resolved the problem. Current consumption will be about 200mA rising rapidly with increased volume. If the power supply is not adequate, power spikes will drag the voltage down re-booting the Arduino. In any case, you will require a considerably more powerful PSU to drive the device as a transceiver. On power-up and with the antenna connection grounded the rx is quiet but with slight synthesiser noise breaking through which disappears as soon as an antenna is connected. Pete has supplied a sketch that permits the device to be used on 20m – as well as changing the sketch over, new BPF and LPF will be required. Component values for these may be found by browsing other of Pete’s designs. Anyone building this device really should consider joining G-QRP. I have referred to Rapid Electronics several times as I have obtained components from them – I have no connection to them but have been a regular customer for 2 or 3 decades and have always had good service from them.